Order 2018 1 oz Congo Silverback Gorilla Coins now! Demand is certain to be high for the 2018 1 oz Congo Silverback Gorilla silver coin, the latest release in the Scottsdale Mint's much-loved Silverback Gorilla series. Since its inauguration in 2015, the coin has enjoyed outstanding success among the world's most discerning collectors and investors. 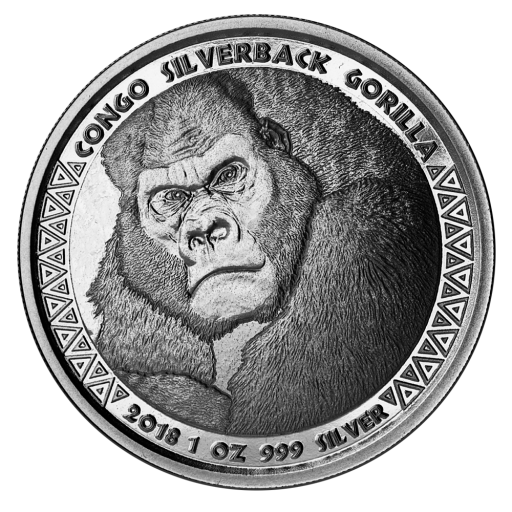 Now in its fourth year, the reverse of the 2018 1oz Congo Silverback Gorilla silver coin features a detailed portrait-style design. A majestic Eastern Lowland silverback is framed within a tribal style border with the inscriptions "Congo Silverback Gorilla" and "2018 1 oz .999" at the top and bottom edges. A silverback is an older member of a group of mountain gorillas; these dominant males are named for the silver saddles that appear on their backs as they mature. Why choose the 2018 1 oz Congo Silverback Gorilla? The beautiful 2018 1 oz Silverback Gorilla coin is a striking addition to any collection. An annually changing reverse design and exceedingly low mintages have ensured that each new release is eagerly anticipated. And, of course, since the coin is struck from one troy ounce of .999 silver, it's an excellent investment. Order your 2018 1 oz Congo Silverback Gorilla silver coins now with coininvest.com. Single coins are shipped in plastic capsules and blister packaging. Investors can also buy the 2018 Silverback Gorilla in multiples of five in cardboard packaging or as boxes of 125. All coins are fully-insured for fast shipping to your preferred address.